Gathering God's family on both sides of the veil and the role of Priesthood leaders and ward councils and Temple and Family History Consultants was the theme of the Leadership session taught by General Authorities at RootstTech 2018. During the first 2 weeks of April we will cover some of the highlights of that training. Elder Dale G. Renlund conducted this session. According to the Deseret News. Sister Joy D. Jones, Primary general president and a member of the Temple and Family History Executive Council, said, “Children love to learn about their ancestors. Family stories can teach them important lessons and help them develop a foundation of strength they can draw from throughout their lives.”Show only the 1st 5:32 of the video! Stop at the end of her talk-do not show the rest the video! Her mention of the rising generation and involving primary children particularly those who are11 and 12 years old, ties nicely into our summer activity, Family History Detective Training. Maybe it could be mentioned along with how youth groups come to the Library. Additionally, this year's Ogden Family History Conference will have a great deal to offer the young single adults. “Helpers should teach following the example of the Savior, line upon line and precept upon precept. Experiences should be tailored to the participants' level of understanding of family history, and you should be considerate of their time. Invite the people you are helping to bring their own personal electronic device. Invite the participants to learn by doing. If you have time you can click on all of the "See More" buttons.but "Minister One-On-One" fits best with Elder Kearon's talk. 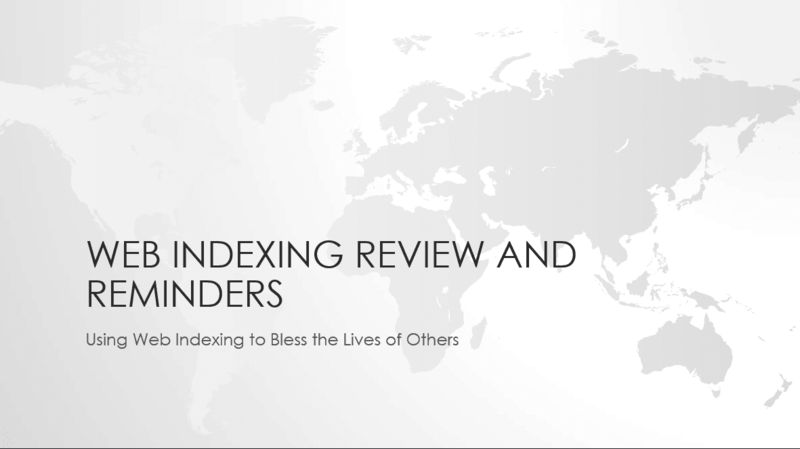 April 16-21 -We have been asked to provide some additional Indexing training to start another Ogden FamilySearch Library Indexing Challenge to help Fuel the Find during this week. An overview on changes to indexing including emphasis on staying current with instructions, changes, different formats and how to find the review tab. 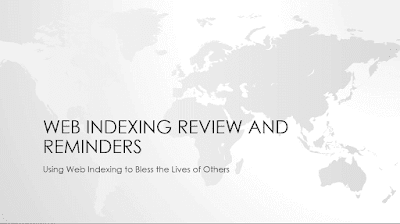 Need to encourage volunteers currently indexing to start reviewing as there is an urgent need for this. If you have time you could go to the blog Here and cover the information in the blog about Reviewing. Note: While working on the May training I stumbled on to some Web indexing Videos that could supplement the above slide presentation.